Torque testing is a way of determining how an object will react when it is being turned - during normal operation or being twisted until it deliberately fails or breaks. This rotational force can be 'dynamic' often delivered at ultra-high speed or 'static' at a much lower speed. Mecmesin specialises in solutions for ‘static’ torque measurement. Static torque measurement is increasingly used by manufacturers as a quality-control method to comply with industry standards. It ensures the proper functioning of components and serves to record their safety and fitness for purpose. It can even help to determine the root cause of a wide variety of defects, which can then be addressed in the production process to reduce costs and improve yields. Mecmesin has specialised for over 40 years in supplying torque testing equipment to the world’s top companies. Our expertise lies in our ability to deliver solutions across different industries, with everything from simple 'handheld' torque instruments to sophisticated 'motorised' test systems. Mecmesin design and engineer torque testing equipment with the customer and operator at the forefront. Minimising training time with our trademark easy-to-use interfaces enables you to start testing more quickly. 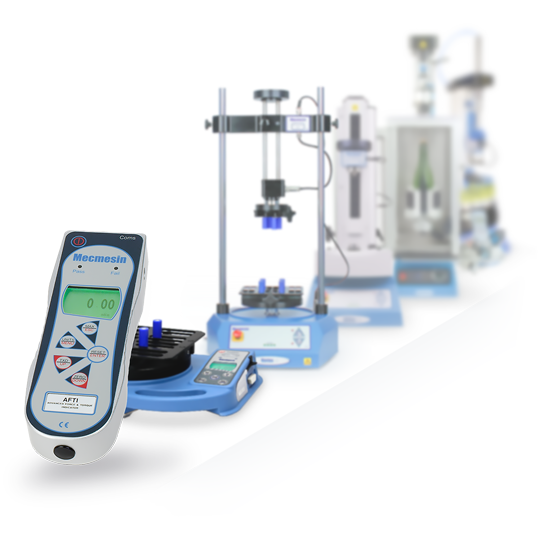 Great value and easy to use solutions that are ideal for product testing in quality control (QC) labs, research and development (R&D) facilities, and on production lines. No matter what your requirement, our torque testing equipment offers outstanding versatility to cater for your ever-changing needs. All of this is backed-up by a global support network to ensure you receive the best possible performance from your test equipment at all times. Looking for a simple economical solution to measure torque by hand ? Mecmesin has a range of easy-to-use, portable instruments to suit your budget. Need repeatable, high accuracy data and great value? Mecmesin torque testing systems are versatile and can be tailored to your unique requirements. The Helixa-i is a top of the range torque tester controlled by software running on a PC. Designed for precision torque applications where torque forces may be very small and accuracy is the priority. With a wide range of precision fixtures, the Helixa-i is easy to use and optimised for measuring torque from as little as 1 mN.m right up to 6 N.m. The Helixa-xt is a top of the range torque tester controlled by a touchscreen console. Designed for precision torque applications where torque forces may be very small and accuracy is the priority. The Helixa-i is a precision torque tester controlled by software running on a PC. Designed for precision torque applications where torque forces may be very small and accuracy is the priority. With a wide range of precision fixtures, the Helixa-i is easy to use and optimised for measuring torque from 1 mN.m to 6 N.m. The Vortex-i is a top of the range torque tester controlled by software running on a PC. Accurate, easy to use and optimised for measuring static torque up to 10 N.m. The ultimate flexible solution for automated torque testing of a wide range of closures and components. The Vortex-xt is a multi-functional torque tester controlled by a touch-screen console. Rated up to 10 N.m it is accurate, easy to use and ideal for standalone use. Its versatility as an automated torque tester makes it the perfect solution for routine testing of a wide range of closures and components. The Vortex-dV is a versatile, robust, stand-alone torque tester, rated to 10 N.m. Easy to use, it is suited for routine quality control checks in a production or lab environment. Configure this motor-driven stand with a torque sensor connected to a display unit, a choice of gripping fixtures, and optional software. The ABC-t is an automated bottle closure tester to measure both initial slip and bridge torque of a complete batch of roll-on-pilfer-proof (ROPP) closures. Automated batch testing of closures ensures repeatability without the need for an operator during the testing period. With preprogrammed tests and one-touch operation the TSCC eliminates inconsistencies in results and repetitive strain injury for operators, which is often associated with manual testing.